The Eee PC from Asus has been out for a little while now, and itâ€™s a bit surprising that we really havenâ€™t seen any competitors hit the market yet. Sure, weâ€™ve heard some announcements from Gigabyte and Acer, but those wonâ€™t be out for a little while. The first one that weâ€™ll likely see is the CloudBook from Everex which should have made its debut this past week. Unfortunately, it has been delayed. If youâ€™re not familiar with the CloudBook, it will have a 7-inch screen, 30GB hard drive and run gOS Rocket as its operating system. With the larger hard drive, it has the ability to appeal to a larger crowd, as Windows could be installed much more easily (though Everex has no plans to offer it preinstalled). It will only weigh around two pounds and should give you around five hours of battery life. 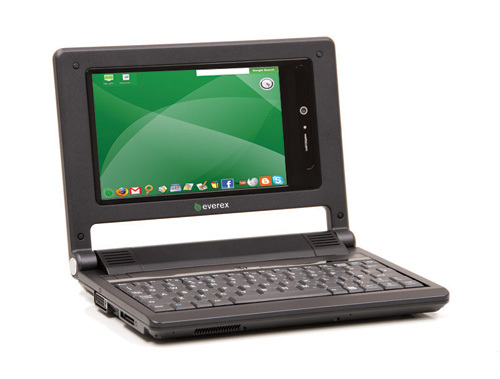 The tiny Eee PC competitor has been pushed back to late February with the blame being placed on â€œthe OS being refined.â€ The new February release date should still make it one of the first Eee PC competitors to hit the market. I guess that it just gives Asus a little more time to polish their crown.